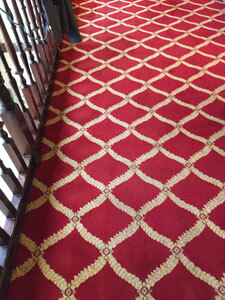 Carpets fitted in commercial settings tend to be of a high quality as to replace or refit them would cause disruption to the everyday running of the business. Any disruption is likely to result in a loss of earnings which is unacceptable. 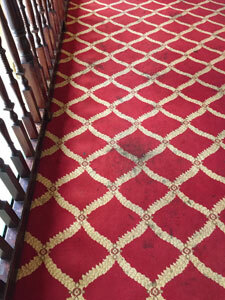 We were asked to clean these hotel carpets in Buckinghamshire. The patterned carpet was of a high quality and we were therefore confident of the positive results that we would be able to achieve. We were asked to deep clean a large expanse of their carpets, including many areas that were stained. Carpet stains can be particularly difficult to remove in commercial premises as there is such high traffic. In-depth understanding is an absolute requirement in order to achieve clean carpets. There is a huge sense of pride in carpets that both look clean but are hygienically clean at the same time. Well-maintained and cleaned carpets offer a positive impression to everyone that enters your premises. Our client set up a regular routine cleaning programme so that they were able to keep on top of their clean carpets. Dirty carpets harbour particles that act like sand paper on the carpet fibres. If these are left they are able to damage the carpet. Regular cleaning allows dirt to be removed and we will offer advice on how to treat stains in between cleans. Feel assurance in the fact that we use eco-friendly product formulations; there is no risk to your visitors or employees. These are both friendly to the environment but still have the intense power to provide incredible results. If you have questions about our commercial carpet cleaning provision we would invite you to call our helpful staff on 0300 088 2188.